I’ve become adept at this, arriving at the scene early, committing key details to memory. After I turned your name — Tamir — over on my tongue, I Googled it. It means tall or owner of dates or palm tree or wealthy. Your father says you were, in fact, tall for your age. You were, in fact, wealthy in the ways that wind up mattering: of spirit, of intellect, of creativity. Twelve and already embodying the meaning of your name. I will need to remember this, and it won’t be hard. I am sure you had heard of the boys and the girls before you, all gone before their time. I am sure that, by twelve, you may’ve had some sense that cops are not kind to black boys who are tall for their age. In death, you have joined an innumerable host of witnesses, carrying the truth of your final moments with you into eternity, while the rest of us spend years parsing speculation. I’ve a system for marking tragedies like yours. I have taken to following your mothers on Twitter and checking your siblings’ Instagram accounts and listening to your fathers’ interviews, all for more insight into you. And I sigh with strangers and cry with strangers and try to conjure you as someone three-dimensional, someone whose breath I can imagine feeling on the back of my neck as you let out a raucous laugh with friends, while sitting behind me on a city bus. You need to remain real for me, Tamir, because you were real and you were twelve and you had every right to reach adulthood, tangible and talking and marveling that you made it. We all marvel at where we wind up when we’re grown. We think: Unbeknown, I could’ve gone to the mall with the shoplifting girls or rode in the backseat of an idling car whose driver had hopped out to rob someone. I could’ve been pulled over by a cop while on a date with a guy who keeps an illegal gun and weed in his glove compartment. I could’ve been asleep in my living room as SWAT raided the wrong black family’s house (or the right one’s). I could’ve been whiling away an afternoon in my yard or at a playground, like you were, when cops arrived, ready to shoot. I could’ve made too little money to live in a safe community. I could’ve lived in the “safest” community there is and still been black and still been murdered and still been blamed. I could’ve made bad choices or had my good ones go unrewarded. This could’ve gone so much worse. Then we breathe deeply and honor the moment as it is: a better outcome, a sparing, a miracle. We remember children and women and men like you most acutely in these moments, how maybe you were just minding your business, just daydreaming or playing pretend. Or maybe you were pleading to be seen as someone real. Maybe your eyes begged: Before you unholster your weapon, look at the nubs of my fingernails. See how I chew them down till they bleed, how the pads of my fingers puff around them so that it’s hard to pop the tab on a soda can? Before you disengage the safety, look at my left shin and the half-foot line of brown slashed across it. That’s where I wiped out on my bike when I was seven and tried not to cry because my boys were watching. Before you rest your finger on the trigger, look at these waves in my hair. My uncle taught me how to brush along with the grain. Before you shoot, my daddy is around. Before you shoot, I make my mama laugh. I am real. It makes me proud to make my mama laugh. I am human. I failed science. I am real. I stole a candy bar once. I am human. I might’ve planned to shoot this BB gun at birds. Before you shot. But God help us if we ever stop imagining you, Tamir. Have mercy on our souls if we stop trying to resurrect you with vivid, near-futile envisioning. I am touching my hand to the tenor of your name in my pocket. Tamir. I am thinking of you as taller still, as wealthy in the way that should least matter. You are rich, and you are grown and, now, your eyes are more discerning. But there is still wonder in the glint of them as you marvel over where you’ve wound up. You think: I could’ve been mistaken for menacing. I could’ve pulled my airsoft pistol in a moment of play, and police may’ve been present, poised to kill me. Wouldn’t that have been wild? Wouldn’t that have been my family’s worst horror? You think, in your house made of crystalline air, your home in the Great By and By: Thank goodness I live in a world where things like that never happen. → More at Buzzfeed, on Beauty and Sorrow. ← Two More Updates: HuffPost Live and Colorlines. This was beautiful. Praying for his family. Praying for my brothers, my son, my cousins. For everyone who ever encounters a scared police officer with ill thoughts of who we are and what we deserve. Praying right now is all I can do for those who are lost but resting up for the battle to change this story. Currently fighting back tears. Thank you, Stacia. Thank you for this reminder. Your words made me cry. Real tears streaming down my cheeks because you found the words to express so fully the “there but by the grace of God go I” grief I feel for the family left behind after these senseless murders. 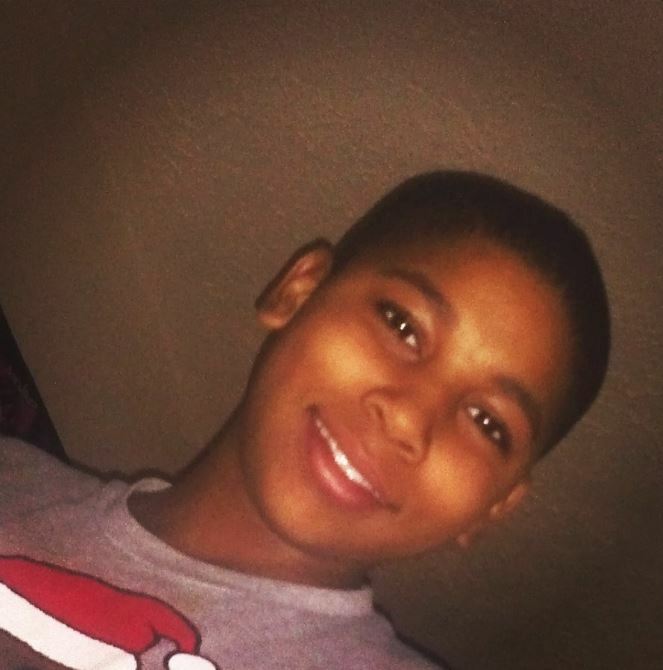 Tamir… What a beautiful name for such a beautiful boy. We are of the same mind, Stacia. My tongue is crowded with the names of Black men killed by police this year. Say their names loudly and often. We partake this ritual like communion, sipping the shared misery that is preventable grief. This is my heart, broken for you. Each drink leaves me more sobered. Each new tragedy like a wafer dissolving in the salt of tears: may the next name we speak not be a body we have known intimately. Amen. Crying now. This was very beautiful, thank you for writing it. This was a beautiful tribute to Tamir. Your words brought tears. More so the tragedy in knowing that many will forget him and the others as we continue to fight the good fight. Constantly pray for all of the Trayvons, Michaels, Erics, (insert a name of a black man) of our world. Pray constantly for our world. This is beautiful. Reblogged today. Thank you. I would say I’m holding back tears, but I’m not. I’m openly sobbing. It’s astounding you were able to condense the collective conscience into such a deeply personal, individual statement. From all of us struggling to find the words tonight, thank you. Thank you so much for writing this. I think of Tamir so often. I reposted this on FB a while back with my response and wanted to share it with you here. If you feel it inappropriate, feel free to take this down. “Last night, I had an intense conversation with my son, who is so close to Tamir’s age. He is upset that he has so little power and can make so few of his own choices. He finds the concerns of adults for his safety oppressive. He’s a normal kid: restless, capable of more than we give him credit for, naive, curious, and most of all wanting what’s fun. He wants what he wants. He complains whenever there’s a rule that gets in his way. A few months ago my father kindly offered to give my kids a pair of cap guns: zinc six shooters with bakelite faux pearl handgrips. They looked absolutely real at 5 feet, although the bright orange plastic tip hadn’t yet fallen out of the barrel of one of them. All I could think of was Tamir. My son, my son. My son lying still in Seth Low Park because he pulled one out to play with at lunch time across from school. My son lying still on Cortelyou Road because not all cops can tell the difference between a game and a robbery…because a good guy with a gun acted when law enforcement was too far away, neutralizing the threat of my son, my son. All this in an instant. In the next, the disgusting comfort…my angelic blonde boy. He might be able to play with his toy gun in his Brooklyn playgrounds and live. No one would take him for a thug – even if he was one. Right? Is that the idea? That *my* kid can live in a Leave It To Beaver world, while Tamir oozes in the snow by Timothy Loehmann’s feet in Cleveland? Am I supposed to insist on this? Should I demand the privilege of my white kid’s safety? If so, how do I explain to myself – to my son – what happened to Tamir? Does it require believing that Tamir got what was coming to him for some reason – maybe because he shoplifted once, his dad got arrested once…something, anything?